A seventeenth-century Dutch painting looted during the Second World War and bequeathed to the City of London Corporation will be restituted to the 96-year-old daughter of its Dutch owner, the late Dr J. H. Smidt van Gelder, director of the Children’s Hospital of Arnhem, at a ceremony at The Mansion House, London, on 6th November 2017. 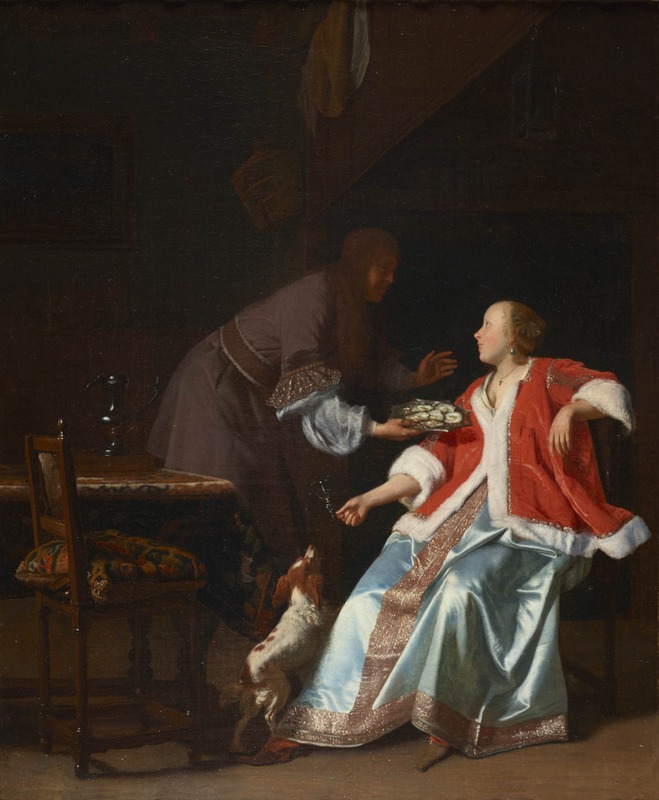 Earlier this year, The Oyster Meal by Jacob Ochtervelt (1634-1682), one of the Old Master paintings in the Harold Samuel Collection at The Mansion House, became the subject of a well-substantiated claim from the London-based Commission for Looted Art in Europe, acting on behalf of the family. In January 1945, following the Battle of Arnhem, the town was plundered by the Germans. The Oyster Meal was one of 14 paintings stored by Dr Smidt van Gelder in a bank vault in Arnhem for safekeeping, all of which were looted. Despite extensive searches after the war, The Oyster Meal and five other paintings were never found. The restitution claim, which was submitted with extensive supporting documentation, traced the previously unknown history of The Oyster Meal between its disappearance in January 1945 and its reappearance on the art market in Switzerland in 1965. The oil on canvas, which was acquired by Harold Samuel in 1971, has been displayed at The Mansion House, the official residence of the Lord Mayor of the City of London, since 1988, following Lord Samuel’s gift of 84 art works to the City of London Corporation. The bequest in 1987 came with the condition that they be retained there permanently. However, on hearing about the claim, the daughters of the late Lord Samuel readily waived the condition and agreed that The Oyster Meal should be returned to the family. Once the Samuel daughters’ consent was granted, the City of London Corporation approved plans to reunite the painting with Mrs Charlotte Bischoff van Heemskerck, the surviving daughter of Dr J.H. Smidt van Gelder. Mrs Bischoff van Heemskerck will travel from Holland to London to meet Lord Mayor Andrew Parmley, who will present her with the painting at The Mansion House on 6 November. “When I heard about the restitution claim, I felt it entirely right that ‘The Oyster Meal’ be reunited as soon as possible with the family who owned it. My colleagues and I at the City of London Corporation were unanimous in our decision to seek approval from Lord Samuel’s daughters to authorise the painting’s restitution and we have worked closely with the Commission for Looted Art in Europe towards achieving that goal. "The recovery of my father’s painting after so many years was truly a collective effort. We are very grateful to the Commission for Looted Art in Europe for the countless hours spent establishing the history of this painting, and to the City of London Corporation for honouring our claim in such a professional manner, and for taking such a constructive and positive approach. “This painting was one looted from our family during the plunder of Arnhem which impacted so many families in our community. For me, its return is representative of the co-operation between the Allies, which helped save our way of life so many years ago. Although it is a bittersweet recovery in the context of the great devastation and loss of the war, it is very meaningful to my family, and we are delighted to bring it home again to honour my father’s legacy." “The painting was plundered in terrifying circumstances after the Battle of Arnhem, when many British lives were lost and so many Dutch families were terrorised. It is very moving that a painting of such meaning to her and her family is at last being returned to 96-year-old Mrs Bischoff van Heemskerck, who lived through those times and remembers the painting so well. The Harold Samuel Collection is housed at The Mansion House, which serves as the Lord Mayor’s official residence in the City of London. Lord Harold Samuel of Wych Cross, a property developer and entrepreneur, left it to the City of London Corporation for permanent display at Mansion House in 1987. The collection, which is formed of 84 works of art, brings together some of the finest Dutch art in Britain, including The Merry Lute Player by Frans Hals and ​A Young Woman Sewing by Nicolaes Maes. Anne Webber, Co-Chair, Commission for Looted Art in Europe; and Mrs Charlotte Bischoff van Heemskerck will be available for interview. An image of The Oyster Meal and photographs of Dr Smidt van Gelder are available on request from Andrew Buckingham and Anne Webber. The Commission for Looted Art in Europe (CLAE), is an international, expert and non-profit representative body which acts to identify, locate and recover art and cultural property seized between 1933 and 1945 on behalf of families, museums and governments worldwide. It has been instrumental in the return to its rightful owners of over 3,500 items of looted property. CLAE negotiates policies and procedures with governments and cultural institutions and promotes the identification of looted cultural property and the tracing of its rightful owners. In 2001 it set up a Central Registry of Information on Looted Cultural Property 1933-1945 at www.lootedart.com to fulfil Principle VI of the 1998 Washington Conference Principles on Nazi-Confiscated Art. The Registry provides an up to date source of news, research, publications, conferences and developments in this field.